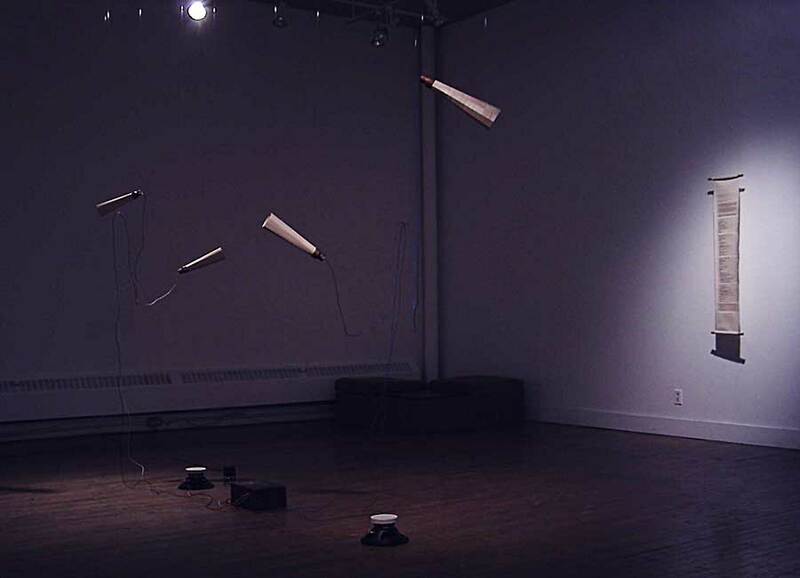 A generative sound installation by Absolute Value of Noise © 2004. 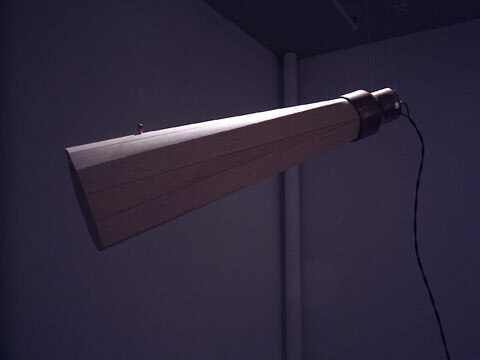 The centre piece of this installation is a "fantastical" instrument in the form of a collection of hand made wooden speaker trumpets - a reference to literary works from the turn of the Century (19th - 20th) that imagine an industrial future full of technologies that compose endless sound-scores. 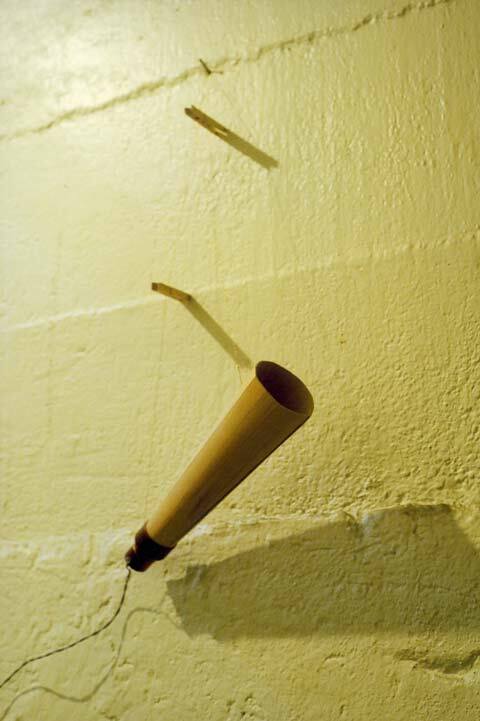 Inspired by an article by Douglas Kahn about imaginary instruments, this piece generates sound collages based on four stories (or four such instruments) - The Factory Floor, Very Low Frequency (magnetic) Sculpture, Ocean Harp and Volcano Trumpet. Spark Writing is a form of long distance communication imagined by Velimir Khlebnikov in 1915. He predicted a strange form of electronic writing that would one day connect fishing communities along the Volga. A few years ago I read an article by Douglas Kahn about "conceptual instruments" (Annual InterCommunication '95, ICC, Tokyo). Kahn described the work of a number of writers from the turn of the last Century (late 1800s to early 1900s). These authors imagined such musical instruments as volcanoes shaped like flutes and trans-atlantic cables that acted as giant harps - plucked by the ocean waves during a storm. Inspired by this, I delved deeper into the works of Russian Futurists and early Science Fiction writers. Using a similar style to some of the works I had found, I wrote four texts about different fantastical instruments. This text, cut into a broken narrative, is interleaved with the sounds of the proposed virtual instruments to form the basis of a generative sound score. The piece uses generative audio software that I developed to run on a Macintosh Powerbook. 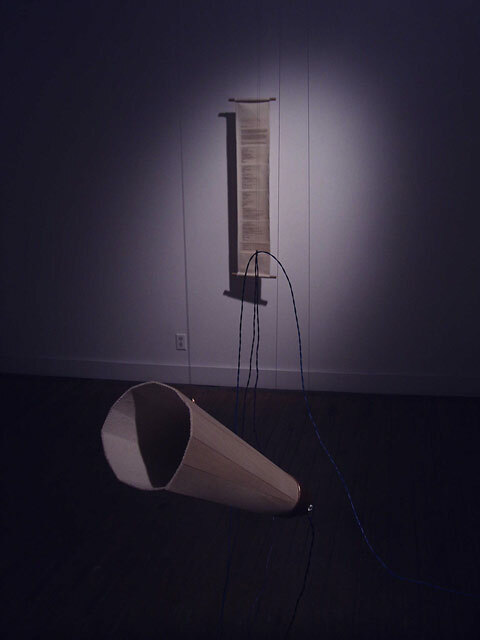 It generates threads of sound, each involving a different narrative (one of the four stories). 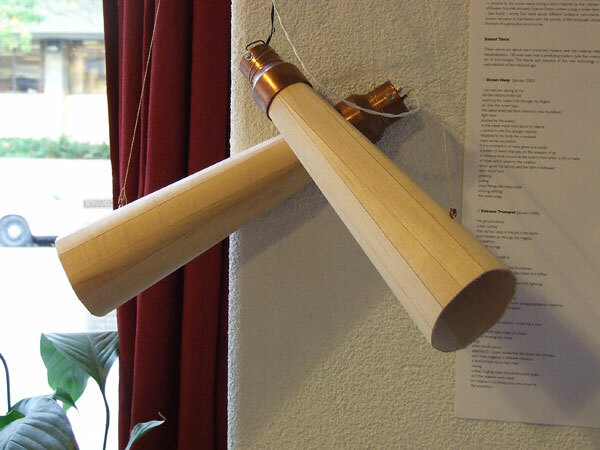 These sound threads are then played on handmade trumpet-like speakers that hang from the ceiling on mono-filament (fishing line). 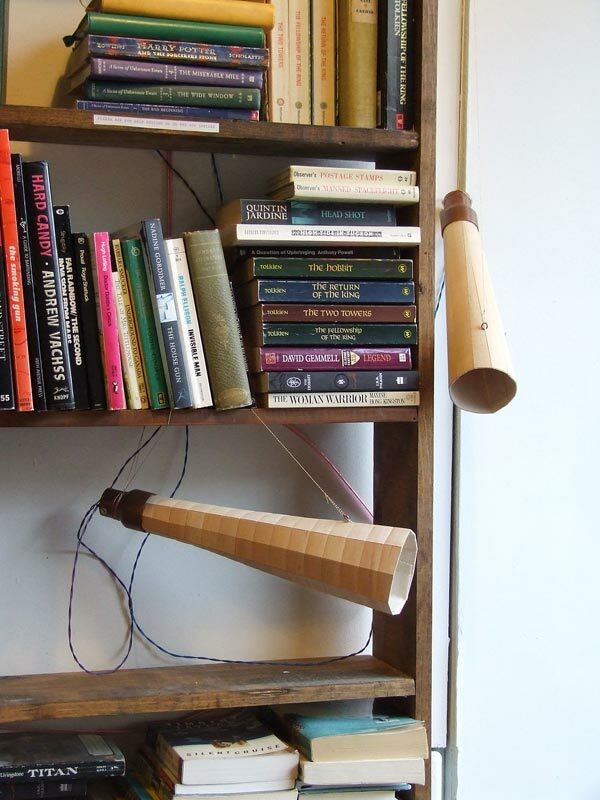 The speakers are connected to the computer by braided-copper wires that also float in the air to a certain degree. These visions are about man's predicted mastery over the universe, realized through massive industrialization. 100 years later, man is predicting mastery over the universe through a different set of technologies. The theme and direction of this new technology is eerily similar to the early idealism of the Industrial age. as the waves move from storm to silence. which guide the storms and the calm in between. An audio excerpt from Ocean Harp (4:30). so that i shook with it. the vibrations spread and thundered. like liquid made of beads. behind me the world snapped with lightning. in a cage with bars made of rubber. attached to copper spirals that fed down into the lava. An audio excerpt from Volcano Trumpet (4:40). and drilled great bars of iron, aluminium, nickel, bronze. the powerful force of electricity that moved the world without need of crude fire and steam. and everything shuddered under its thundering blow. but neither our steps nor our voices could be heard in the sea of sounds. An audio excerpt from The Factory Floor (2:56). snapping into the arctic sea. of the aurora borealis and the flaring of the sun. and the sun goes wild passing through an invisible cloud of magnetism and galactic dust. leaving only our imaginations to fill in the silence. 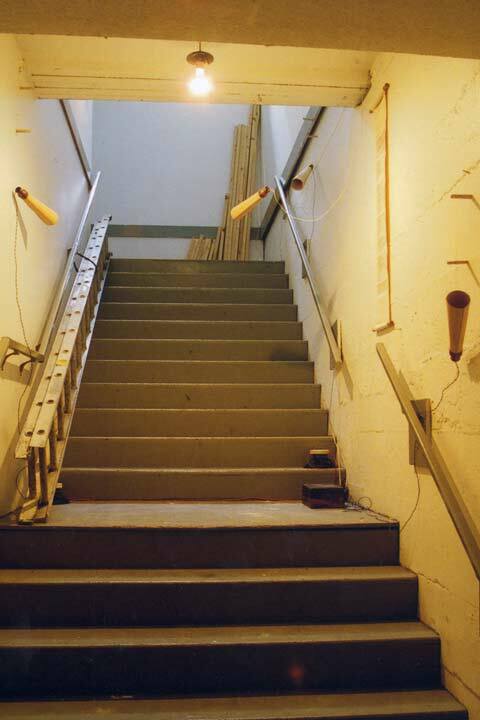 An audio excerpt from The VLF Sculpture (4:28). Text and sound - Absolute Value of Noise. Voices - Joelle Ciona and Lori Weidenhammer. "Ocean Harp" and "Volcano Trumpet" were inspired by "Open Letter to the Workers" (1918) by Vladimir Mayakovsky. "The Factory Floor" was inspired by "Red Star: A Utopia" (1908) by Alexander Bogdanov (Malinovski). "The VLF Sculpture" was inspired by a piece by Vancouver artist Gwen Boyle who built such a contraption north of the arctic circle. Solder and Sons cafe and book store, 247 Main Street, Vancouver, October 16 - December 11, 2008. Tone Deaf in Kingston, November 19 - 25, 2007. Interactive Futures at Open Space in Victoria, January 26 - 29, 2006. 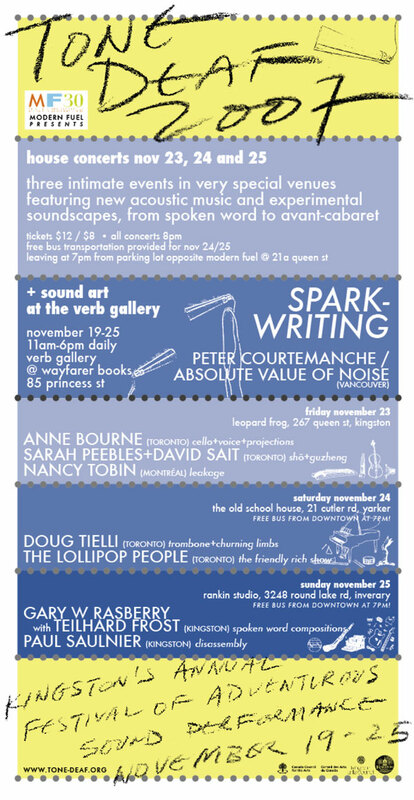 Send + Receive: a festival of sound, Winnipeg, October 15 - 24, 2004.